And it really is. I love this time of year because it's a very important time for the discerning shopper. While most people are super focused on preparing for Halloween (whether that means costumes, parties, or house decorating), there are a select few who are already on the prowl for Christmas stuff. Hello, I am one of those people. While I purchased this year's ornaments last year (and bought a TON of stuff like this at 80% off) . . . I'm still paying attention to what's coming out because I LOVE Christmas ornaments and decorations (not the cheesy kind, though). So I give this lead in to set up today's discussion about the "Dollar Tree" store. Last year I purchased some ornaments at Dollar Tree and was pleasantly surprised at their selection! I really believe they have something for everyone there, even if you're a "big budget" holiday decorator. While having lunch the other day I passed a Dollar Tree and saw some items I plan on picking up for next year's tree, which will probably be a bit more traditional. I bought a card in the store and found out that some items are less than a dollar, which means, depending on what you find, you're likely to get 2 or 3 ornaments for $1!!!! If that's not a steal, I don't know what is. They have some nice stuff and the time to go is now, while everyone else's (can I say "else's"???) head is turned the other way with Halloween. Once the 31st passes you'll have to visit several stores to find the quantity/style you need. Now I have to pat myself on the back for my perseverance today because I tried to take photos earlier but my battery was down, so I came home and charged it and then went back . . . especially for you. Come with me ("and you'll be in a world of pure imagination," as Willy Wonka would say) . . . .
Lots of good looking stuff on this wall. Personally, I always love 1 or 2 large impact pieces on my tree like feathers, flowers, ornament balls, etc. This flower doesn't look so hot in this photo, but it was cute in person and it was only $1!!!!! In the past I've spent $50 alone on just these pieces, so getting 15 for $15 is a deal. For those of you considering going with bright colors (or silver & white, all white or whatever), these balls are great. This whole set up is probably $8. I really like these and am thinking about getting them just to have. They don't look like $.50 ornaments either. **after reading this item before posting, I've decided that they might look like $.50 ornaments, but if so they would be the kind from Target that were marked down to $.50 after the season. This distinction needed to be made, because it's different than "dollar store" cheap. Moving on . . .
Now I don't even need to narrate this one--you know this is a good deal. Plenty of those door handle thingamajiggs. I'm not sure that I need (well, I don't need ANY of this stuff, so I should say want) one, but if I were to get one, I would choose from the rustic looking section on the left. Now this wall is probably a touchy subject, but I'm not advocating for using them on the nightstand in your home. For those of you who like to make wreaths using flowers (versus berries or ribbon), this might be your stop. Everyone loves a bow. I don't like how these turned out looking so ashy on camera, but they were pretty decent in real life. Great for wreaths, doors, car grills (hey, people do it . . ), etc. Also, peep the wreath hangers and ribbon. I also saw lots of wire and wire cutters in the back. They even had that grocery store tie stuff (bread) on a roll, which is great to have around if you're crafty like me. So, lots of good finds, right??? I know. If you don't have a Dollar Tree in your area, check your dollar store and see what's available. Let me know what you find, too. And in other news, LaTasha at Symone's Mommy's Blog has done a blog spotlight on little ol' me!!! I'm so excited because this is my first blog shout out from someone who's not already my friend!!!! It's so nice to know that people are reading and interested in what I post. Now that I'm into this blogging thing I understand why people ask for comments. I used to think it was like begging for complements, but I understand now that if no one ever writes anything, we bloggers start to feel like comedians doing stand up to an empty room. Thank you to my friends and wonderful sister, who encourage me to continue posting, and thanks to those of you who stumbled upon me from other places as well. 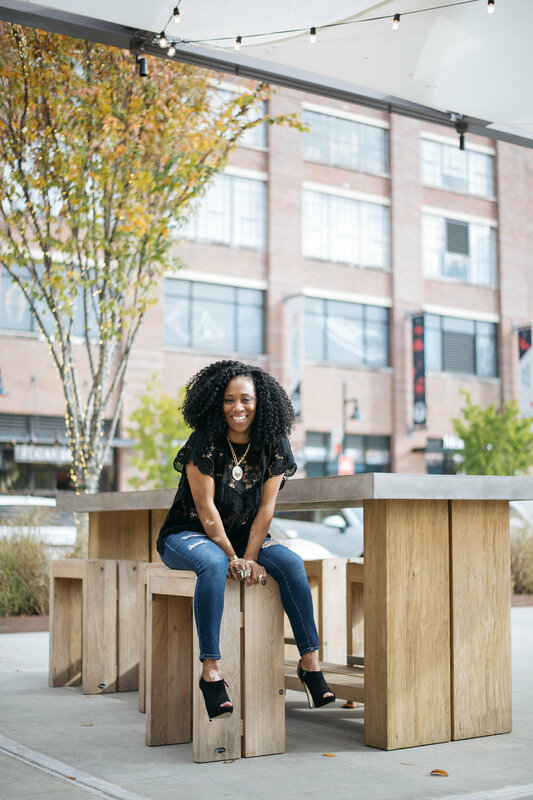 Please check out LaTasha's blog, and if you're into thrift store furniture finds pay close attention because she gets the best stuff (and I really mean that) for the lo-lo! I wish I lived closer so we could be thrift store friends--she could show me where the deals are, and I'd show her how to refinish the stuff she finds! Sorry this is so long, but thanks for staying with me!